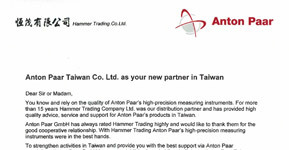 On January 1, 2019, Anton Paar opened a new subsidiary in Taiwan with the headquarters located in Taipei. This move brings us even closer to our customers in the Taiwanese market. We will provide you with extended sales and service as well as application support for our entire product portfolio first-hand. Our sales and service team is happy to support customers throughout Taiwan. The new subsidiary took over operations from the former distribution partner Hammer Trading.